On Easter, most of the Shrine is closed. However, the Basilica will open at 12PM for Confession and Adoration at 12:15-1:15PM, followed by Mass at 1:30PM. After Mass, the Basilica closes at 3PM. We welcome everyone to join us. 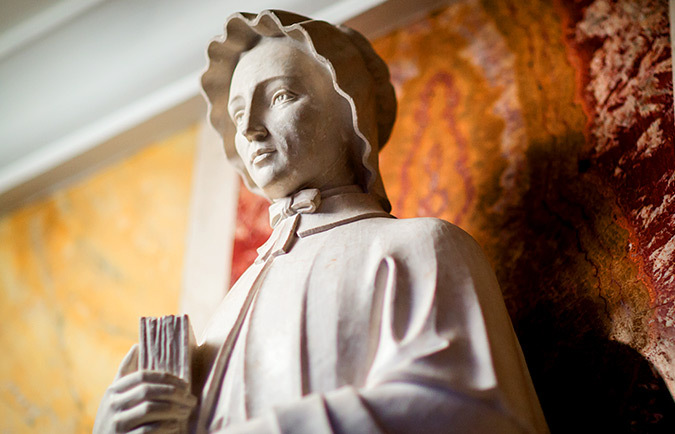 Discover the inspirational life and legacy of Saint Elizabeth Ann Seton. Begin your visit with a brief film about Elizabeth Ann Seton and browsing our exhibits. including our latest, Sisters Today: A World of Difference. Awe-inspiring and amazing are a few words people have used to describe the Basilica. Discover how the Daughters and Sisters of Charity continued Elizabeth Ann Seton’s ministry of charity, helping those who were in need or wounded during the Civil War. Step back in time while you tour the Stone House, which was originally built in the mid-1700s. This historic home was built in 1810 when Elizabeth Ann Seton realized one home wasn’t enough for all that she had in mind. In 1809, Mother Seton and her companions took a walk through the dense woods on their property to select a site for a cemetery. Elizabeth Ann Seton was a wife and mother, and then found herself a widow at just 29 years old in 1803. Despite the hardships that she faced, she went on to do amazing work, and eventually became the first American-born saint in 1975. Visit this historic site and Shrine and see the museum, her historic homes, and the Basilica dedicated to her.